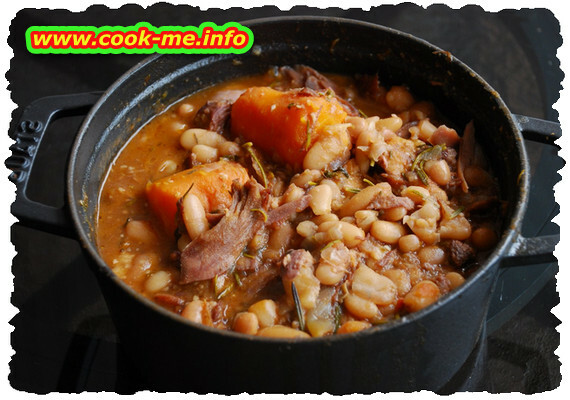 A delicious traditional beans recipe. Medium complexity , ready in 1:30 hours . Boil the beans in the pressure cooker along with the pork knuckle and the carrots. Cook the onions and the peppers cutted in large pieces, then add the tomato juice. Mix the beans and the pork meat with the sauce from above ( the one with onions , peppers and tomato juice ). Let it boil 10 minutes, during which you continually mix otherwise it will stick together , then add pepper , thyme and after it cools a bit add the parsley too. SERVING: Beans with pork knuckle is served hot with pickles.